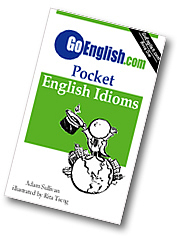 Today's Idiom = "A Known Fact"
A known fact is a fact that many people know to be true. Example: "That guy is a gangster? Are you sure?" Reply: "Of course I'm sure. It's a known fact." When you say that it is a known fact, you are saying that other people also know it to be true. You are not the only person to know the thing which is a known fact. A known fact is is "known", meaning people know it, and it is "a fact", meaning it is true. Example: "He used to be an actor? I didn't know that." Reply: "Sure. It is a known fact."